Raymond Ciriako is ASE certified and has been in the automotive field since 1990. His philosophy is taking care of the customer to its utmost extent, and meets or exceeds every customer expectations. With his customer service and automotive knowledge he finally opened his own repair facility in January 2010. Here at Precision Auto Repair we take the time to explain in a simple way the type of services and repairs that are needed for your vehicle. My wife, Shelly Ciriako is the driving force in starting this new venture. 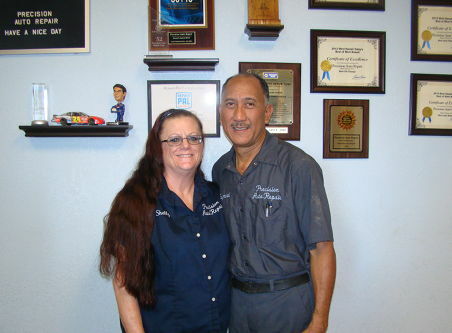 She has worked with Raymond in the automotive field before and encouraged him to fulfill his dream of owning his own business. She currently does all the accounting and bookkeeping for Precision Auto Repair. Our National NAPA AutoCare Warranty We currently offer the NAPA AutoCare "Peace of Mind" Warranty, providing our customers with 12-months/12,000-miles of worry-free protection on qualifying parts and labor. Wherever you may travel, our warranty is honored at over 13,000 NAPA AutoCare locations across the country.